Alexander thus chose the island of Pharos as the site for his city of Alexandria. Alexandria aspired to house all the Hermetic arts. It was a melting pot of cultures; a newly built city with a visionary outlook and an ancient lineage. With its thriving sea port, Pharos became famous for the library of Alexandria – and the Pharos lighthouse, one of the seven wonders of the ancient world. 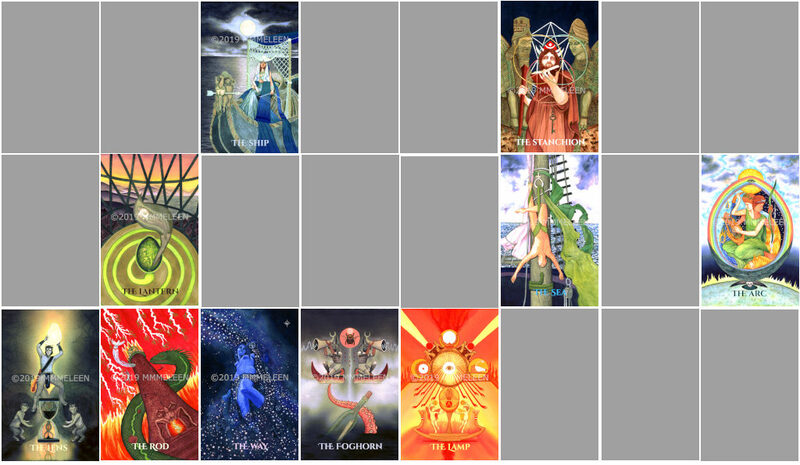 Pharos Tarot travels the color scales through light, the medium of watercolor, known for it’s luminosity as pigment is diffused in water transparently allowing the light of the white paper to shine through. This is what the drawing of the Hanged Man looked like before it was transferred to watercolor paper. You can see that I’m not bothering to render the shading on the forms, or add in all the details like the ropes and ladders and the pulley, or the sparkling water. Just a roughing out of the biggest shapes. 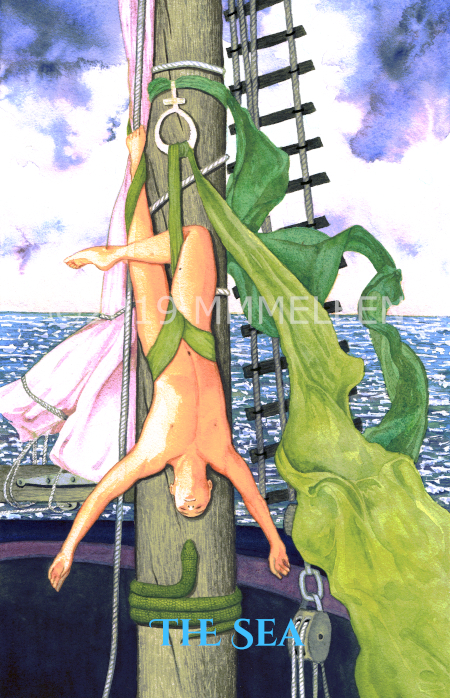 The scene is meant to give the impression of strong sunlight (fire) and a breeze (air) over the waters, on a sunny day upon the sea, as the hanged man suspends himself in a meditative pose upon the ship’s mast. 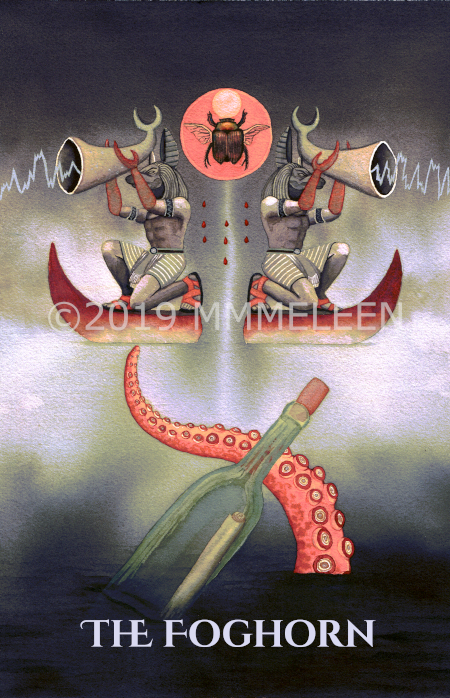 Unlike Odysseus, who lashed himself to the mast and plugged his ears with wax to avoid hearing the call of the sirens, the Hanged Man remains open, gently suspended by his serpentine silks, inverting himself to listen for the wisdom inherent in other perspectives. The King Scale is Deep Blue, for elemental water, the depths of the Sea. 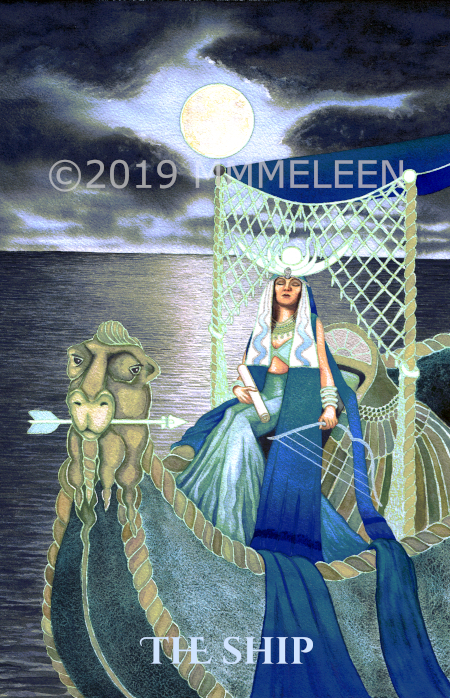 Blue is associated with the Priestess card, arcana of the Moon, too. On the Minutum Mundum, it’s the color of the sephira Chesed, the sphere of Jupiter. Jupiter is the ancient ruler of Pisces, and the 12th house by association, just as Neptune is it’s modern ruler. There’s a connection between Jupiter and Neptune, or Zeus and Poseidon, as well. As brothers, they drew lots for their share of the kingdom. Zeus was given dominion of the sky and weather (as well as light in the form of the thunderbolt) and Poseidon was given dominion of the Sea. The Pharos lighthouse of the ancient world was said to be topped by a statue. Some sources say the statue was that of Zeus Sotor, or Zeus the Deliverer, to save men from storms. Other sources say it was topped by a statue of Poseidon. No one knows, and the contradictions could exist because perhaps it differed throughout the ages of the lighthouse. It lasted for over 1500 years, finally being demolished by an Earthquake. The Queen Scale is Sea Green. It’s the color of sunlight upon the waters, the color of the shallows as light bounces off of the white sand and up through the waves. The greens of the Queen and the Prince scales call to mind the color of Venus, or Aphrodite born from the foam of the sea. The Prince Scale color is derived from a combination of the parental colors. Mix deep blue and sea green and get the Prince Scale color, Deep Olive Green. This is a color of grounding, and tranquility. It’s a cooler version of the olive color of the Prince Scale for the Hierophant/Taurus, ruled by Venus. Greens and blues are the colors most associated with the beauty of our planet. In color theory cool greens suggest safety, and a place to rest and hang out. The Hanged Man is doing just that. The Princess Scale is often an enigma. In some cases it’s a combination of the three colors that precede it, but not always and not in this case. The Princess Scale color for the Hanged Man is White, flecked Purple. It takes the White of the divine nature of Keter, or godhood, and flecks or fertilizes it with the purple of the lunar sephira Yesod. While in the state of suspended animation, the Hanged Man is communing with divinity, but in a subconscious, non-linear, or lunar way. We see a similar color in the Star card, who has in this scale “White, faintly tinged Purple”. 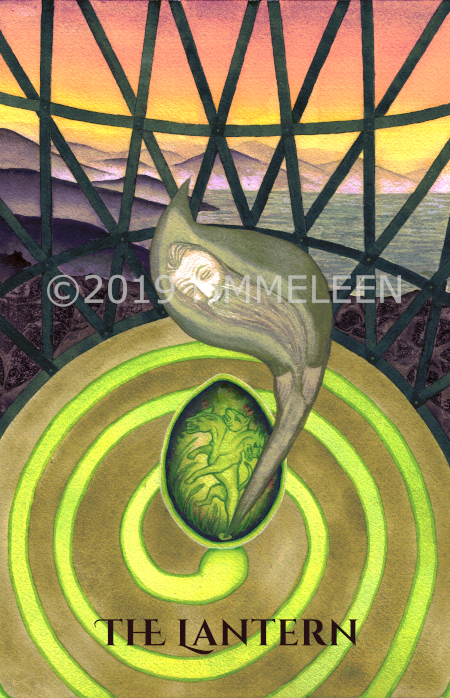 The highest aspiration or connection to the divine through the astral, is only hinted at, or flecked and fertilized, in the Hanged Man. 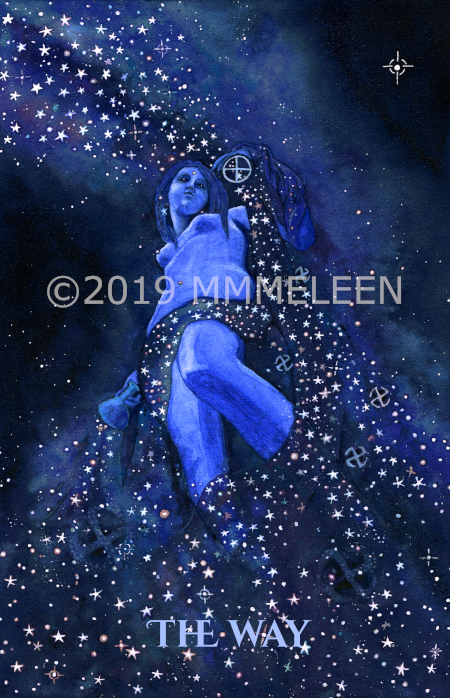 In the Star card, the bits of purple are fully integrated into the white, creating the color of starlight as the daughter of the firmament “dwells between the waters”. The Hanged Man is the element of water itself, while the Star gives it’s light to set one’s course on. I call this one The Lamp. It’s a glyph of illumination and liberty: Light, Love, Liberty, and Life. 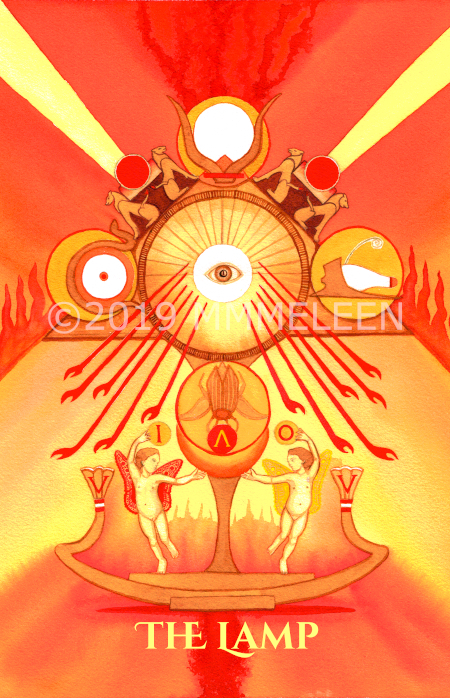 The lamp shows the four stations of Liber Resh vel Helios, Crowley’s solar adoration ritual performed four times daily, at each of the stations of the Sun’s journey: sunrise to Ra in his strength (shown by the sun symbol and serpent), noontime to Hathor in her beauty (shown by her horned crown at the apex), sunset to Tum or Atum in his joy, (shown by his white crown), and midnight to Khephra, in his hiding (shown by the winged scarab beetle at bottom). Twin children dance on the solar barque at the bottom, representing the solar twins as dual forms of Horus or Heru. The active form holds what looks like a one – the pillar. The passive form holds what looks like a zero – the void. Yet they are also the letters I and O, and along with the A between them spell the magical formula IAO. The colors are Orange, Gold Yellow, Rich Amber, and Amber, rayed red. 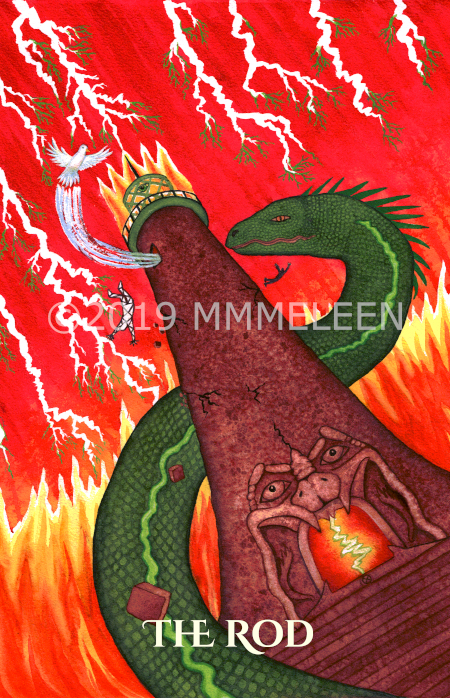 All fiery and of course solar colors, for The Lord of the Fire of the World. The colors are Violet, Sky Blue, Bluish Mauve, and White Faintly Tinged Purple. I took a bit of artistic liberty in that “Sky Blue” here ranges through all shades of blue one might see in the sky, as I wanted it to be a night sky. The violets and bluish mauve form the nebulae. The stars are “white faintly tinged purple”. Next we have the Priestess, who becomes The Ship to take you across the desert of the Abyss. The colors of the Priestess are Blue, Silver, Cold Pale Blue, Silver-rayed-Sky Blue. This is the Moon card. The fog glows, but you cannot see the Moon. The Moon has no air. The horn sounds silently, and something vibrates at the back of your head. 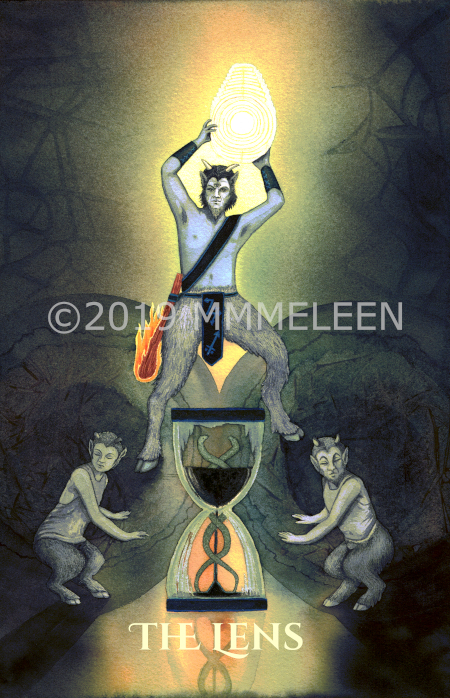 Next card is commonly known as Temperance, or in Thoth based decks, Art. In Pharos I call it “The Arc” as in, the Arc of Visibility. 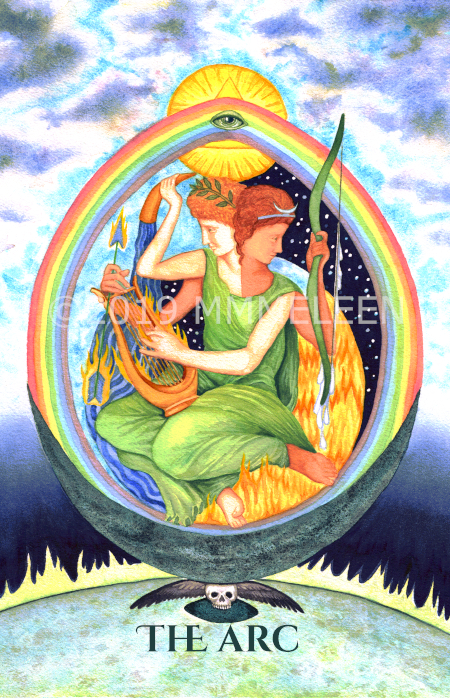 The Arc, aka Temperance/Art, is the card of Sagittarius, and one of my favorites since that’s my Sun sign. Colors are Blue, Yellow, Green, and Vivid Dark Blue. 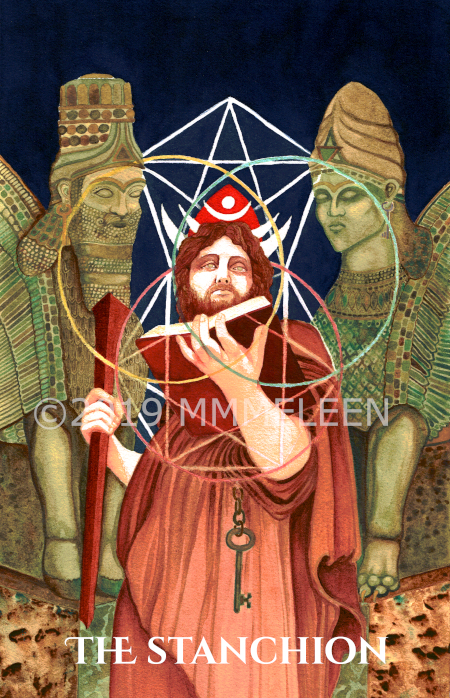 Next up: the Hierophant, in Pharos, called the Stanchion. That’s the pin (like a really big nail) that binds the lighthouse to the rock. Colors are Red Orange, Deep Indigo, Deep Warm Olive, Rich Brown. And here we have the Tower, or in this case, The Rod. (That’s what she said.) On the lighthouse this corresponds to the lightning rod. Here’s a Saturnday friend, the Devil: called the Lens. The lens is like the eye of the lighthouse, focusing the light. I hope you watercolorists will appreciate the beautiful light effect. No other medium can quite compare.